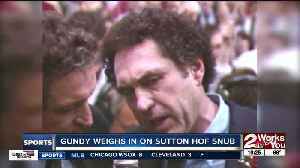 ▶ Videos for "Mike Gundy"
Mike Gundy on Eddie Sutton Hall of Fame snub: &apos;I think its bull----"
Mike Gundy on Eddie Sutton Hall of Fame snub: 'I think its bull----"
Former OSU quarterback Taylor Cornelius and wide receiver Tyron Johnson both shine at Pokes' Pro Day in Stillwater. STILLWATER -- Mike Gundy was happy when Oklahoma State's bowl game was announced because the Cowboys don't have to play until New Year's Eve. Hard to believe it’s been 14 years since those strange days in San Antonio, with Miles running a shell game with reporters, OSU administrators and OSU coaches over his interest in LSU. STILLWATER -- Jahmyl Jeter didn't know where he was going on Tuesday, but the way Mike Gundy put it, he looked good doing it. 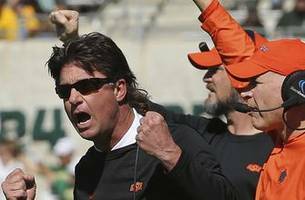 “Any time you lose good players it's going to affect your team somewhat,” Gundy said. Oklahoma State's .500 season led to coach Mike Gundy writing a $250 check to an Oklahoma City radio personality who lost a Las Vegas bet on the team's win total this season. The star running back from Tulsa will not participate in the Liberty Bowl to "pursue future endeavors," Mike Gundy announced on Monday. In Mike Gundy's 14th season as the head coach, OSU had nine-win talent but lost six times. The Cowboy coach and his quarterback were mobbed by students who celebrated OSU’s 45-41 conquest of West Virginia. Gundy will not leave OSU until he retires, and he will never be fired. 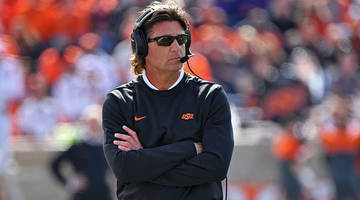 Gundy used buzzwords such as "snowflakes" and "Generation Z" when describing his discontent with the modern ease of transferring in college football. STILLWATER -- Five carries into his third Bedlam, Justice Hill departed with a rib injury and never returned. STILLWATER -- Twelve minutes into a news conference that began with Mike Gundy soliciting opinions on his shirt choice (an orange quarter-zip), it was a story about Gundy’s two youngest sons that.. 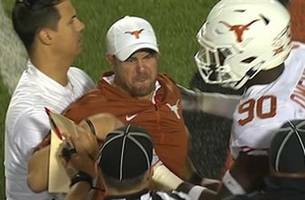 When Mike Gundy reflects on the Baylor failure, he seems most galled by the penalties. STILLWATER -- Two years ago, in a winner-take-all Bedlam game in Norman, Oklahoma State faced a third-and-goal from the 1-yard line with a chance to strike first. Oklahoma State sold out every home game on its 2017 schedule, but Saturday marked the first sellout of 2018.